Happy Birthday to me! I’m thirty! Or, as my wife has taken to saying, I’m Nerdy-Thirty. Honestly, I’m freaking out a little bit about hitting the 30-year milestone. Just a bit. And while I may be getting older, I have to keep telling myself that I’m in the best shape of my life. I’m the lowest weight I’ve been in probably twenty years (seriously), I ran a 27 minute 5k in my very first race, and I’m on my way to running a half-marathon. I also keep joking this is my half-dead birthday because my dad died this past April, and he was 60 years old. (No one seems to think that’s as clever as I do, btw.) And if I hadn’t changed my lifestyle, it probably would be. But now, it’s not my half-dead birthday. It’s my half-marathon birthday. And who knows, 31 might be the year of running the full 26.2. Hard to tell, though. 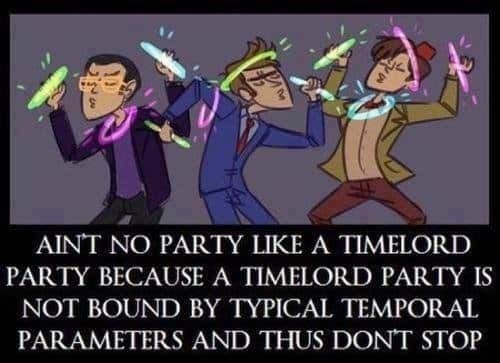 You know how all that wibbly-wobbly, timey-wimey stuff is. So take some advice from a (newly) old man: It’s never too late to change your life for the better. Wouldn’t you rather have a half-marathon birthday than a half-dead one? Happy birthday Beej! Hopefully we can collaborate on some writing soon!